With over 40 years experience, Rosebud Collision should be your first choice! Let our knowledgeable and service minded staff take care of your collision repair needs. Remember - when working with an insurance company after a collision, you have the option to use the collision center of your choosing. 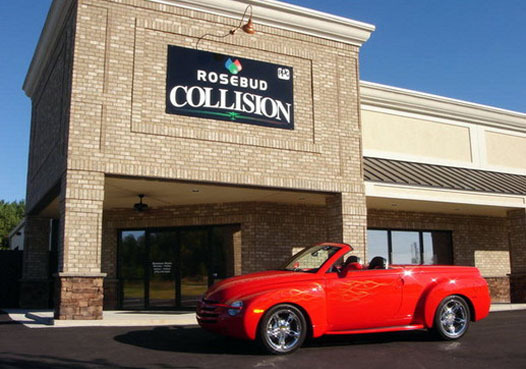 Rosebud Collision has been in the community for thirteen years, works with all major insurance companies, and repairs all makes and models of vehicles. We can't erase your accident, but we can make it look like it never happened. You are not required to get more than one estimate for repairs to your vehicle. You are not required to use a collision repair shop selected by a claims adjuster - You may have the collision repair shop of your choice make the repairs. However, you are required by your policy to allow your insurance company a reasonable amount of time to inspect the damages prior to having them repaired. Only you, the vehicle owner, can authorize repairs to your vehicle. Your vehicle is being repaired for YOU. Repair estimates vary. For example, a low estimate may not include things necessary to properly repair your vehicle or may not include guarantees. It's your vehicle - make sure it is repaired to your satisfaction. Your insurance company wants your vehicle properly repaired and wants you to be completely satisfied with their claims service. You have specific rights and obligations. Review your policy. Understand your rights! Rosebud Collision is ready to help you. We will work closely with you and your insurance company to minimize your inconvenience and maximize your satisfaction.